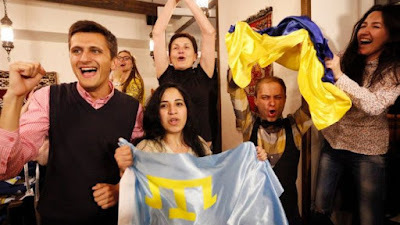 KIEV, Ukraine -- One Ukrainian Crimean Tartar supporting Jamala in Stockholm described her victory as "a big day for Crimea". Victory was savoured in Kiev. "This song is about our tragedy, and it was sung on an international stage," said Emine Ziyatdinova. "Yes!" tweeted Ukraine's President, as he offered Ukraine's "heartfelt" thanks for "an unbelievable performance and victory!" Petro Poroshenko spoke on the phone to the winning singer late last night. The EU's Ukraine delegation also sent its congratulations. And a senior Western diplomat I met last week was keen to sing Jamala's praises as a face of a "new Ukraine". Beating Russia, the favourite, at a time when the conflict in the east of Ukraine drags on will add poignancy to Ukraine's victory. Then there is the subject matter of the song. Jamala has always insisted that it's a personal tale because her great-grandmother was one of those deported by Stalin from Crimea. But like it or not, anything linked to Crimea in Ukraine today has, at the very least, political overtones because Russia's annexation of the peninsula remains an emotive topic and point of grievance for many Ukrainians. That is especially true for Tartars like Jamala, who have left the peninsula and say they cannot return. But the sombre nature of the song had appeared in some ways to be its Eurovision Achilles heel. That's because the lyrics, in both English and Tartar, are hardly the type of catchy pop number that all too often comes out on top. It makes Jamala's victory all the more remarkable. However, for all the animosity between Moscow and Kiev over the course of the past two years or so, there is a very interesting footnote to this year's Eurovision, provided by the popular vote. Ukrainian voters gave Russia a massive 12 points. Russian voters nearly returned the favour, giving Ukraine 10 points. It could be a reminder that the recent disputes between the two countries are to some extent political, not popular, affairs. That is to say, strong family, cultural and linguistic ties mean relations between many Ukrainian and Russian people are still cordial. I should hope that ties remain "cordial" between some Ukrainians and Russians. Russians have no reason at all not to be cordial. Ukraine has done nothing to them. Russians should ask Ukrainians for forgiveness. And as for Ukrainians, I am pleased to learn that Ukrainians still can distinguish between the Russian government and those Russians who are basically decent people.....including its losing Eurovision candidate who, at one time, expressed dissent with Putin's policy in Crimea ( but subsequently recanted). They could have been far more "cordial" if Russians did not insist on intruding in Ukraine's affairs, invading its territory, abusing its citizens, and doing all they can to reduce Ukraine to a vassal state. Without a sea change in Russian attitudes and perceptions in its relationship with its neighbors and its role in the world (and its recognition of the great damage and horrors inflicted on its own citizens and that of other nations) the ties are likely never again to be cordial....except in registering musical preferences in Eurovision.